19th January 2017. Here's a little thought experiment: think about the portrayals you're most likely to see of men and women in fitness and sports advertising. What are these people usually doing? It often breaks down into two gender-defined categories. You'll see plenty of pictures of men participating in solo activities, like working out on the machines at a gym or running on a track. 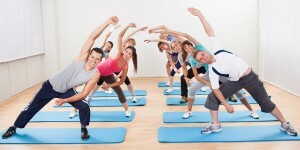 The women, however, will often feature in group activities such as exercise classes. While there are certainly deviations from this formula, they betray a real fact of life: men just don't enrol in group fitness classes at the same rates as women. Why should a group activity be seen as feminine or the domain of women, though? Men actually stand to gain just as much as women from taking part in these classes. Why should you struggle to motivate yourself to make use of your gym membership when the fun and stimulating atmosphere of a class could be all you need? For the guys out there who are still sceptical about the idea of joining a class, we've prepared the following list of eight reasons why you should reconsider. You might find that instead of struggling to meet your fitness goals, you start powering towards them instead! When you're exercising on your own, sometimes it can be a challenge to work out throughout your entire training period. Let's say you head to the gym, and you intend to do, for example, an hour of cardio and an hour of weights. How many of those hours do you actually spend working out ? and how much time do you spend wasting time? It's a problem we all face. In an exercise class, though, there's no room for slacking. Your instructor and your classmates will see to that! You'll have to work hard throughout the entire class period, save for breaks given by your instructor. That equals a much more robust impact on your fitness than a more lackadaisical approach to the workout. Having an instructor at the head of the class has benefits that go beyond just keeping you focused, though. You can improve your overall form when it comes to many types of exercise. Perhaps you like to use spin machines on your own for cardio at times. In an actual spin class, the instructor can point out inefficient movements you're making. In turn, that helps you to improve, and by extension, you're also improving the results you'll see across many muscle groups. While figuring out better form is challenging on your own, it's much easier in class. You might even pick up some helpful tips from your classmates, too. Overall, the collaborative learning environment is one which suits our need to exercise quite well. What's one of the leading causes of that slacking we just mentioned? Boredom. Your brain says "That's enough" even when you have plenty of energy left to give in the workout session. The reason is that you just aren't enjoying the exercise. While you don't need to have fun every second of every workout, it's definitely an important motivating factor. When you want to succeed in your fitness goals, you need to have fun ? and that's why exercise classes can help men, too. By the time you learn the routine, you'll have a blast sweating and exercising in a group. In a way, it almost feels "right" to work out with your peers. When you find that you aren't enjoying your reps the way you used to, a class can help get you back in the groove. It's true that many guys shun fitness classes in part because they erroneously think they won't pose a challenge. You need to think again! Ladies everywhere know that their fitness classes are gruelling, exhausting, and designed to push your body to its limits. From spinning and rowing to more dance-based classes like barre, you'll find that these workouts wear you out like nothing else. That's a good thing, too ? you want to know you left everything out on the field, rather than holding something back. Whether your goal is to lose weight or just strengthen parts of your body, a class-based activity can be just the intensity boost you need. The variety of possible classes is something else men should notice. It's not all about Zumba and Pilates ? if those types of classes don't interest you, you don't need to participate. Instead, what you can do is choose from one of the many other options. You could even enrol in a swim class or a running club ? they exist! You'll get the same kinds of benefits as you would from a more traditional class. Of course, there's nothing wrong with trying out yoga, either. You'll find that the stretching and breathing exercises are not only tough to master, but they can help you in the gym too. Everyone can benefit from being more flexible! Whether you choose this or something else, there's no shortage of options. Boredom doesn't just emerge from a lack of interest in your current exercise. It can also be a symptom that develops over the long term. After months of hammering out the same routine week in and week out, a long break starts to seem pretty appealing. Before you know it, you're sliding towards not working out at all anymore! Your enrolment in an exercise group can help you hit the brakes on that backslide. You don't need to join a class forever. However, you can use one as a way to break up the monotony of your current regimen. How much fun you have could be surprising! Then you can wrap up your participation and return to the routine that was already working for you. There's something to be said for the atmosphere in a fitness class as well. Men are no strangers to encouraging each other to go harder when it comes to exercise ? just take a look at the popularity of CrossFit. Why should they feel any differently in a mixed group? A class is often a highly positive atmosphere, where everyone wants to help their classmates through the lesson. The instructor is there to be the same kind of uplifting influence as well. When you need a dose of positivity in your exercise routine, this is the way to find it. Men need encouragement to succeed just as much as women. Don't shy away from a potential way to improve your ability and how you feel about your fitness. You could come to enjoy all the extra encouragement you receive, and you might make some new and exciting friends among your classmates, too. Finally, there's no reason to think of a class as the "be all and end all" of your approach to physical fitness. You can join one for a while, drop out, and then come back when you feel the desire; you don't need to feel locked into your choice. That's part of what makes classes such a versatile option. While you might view them as the domain of women right now, once you experience a class environment, your entire perspective might change. It can become just another tool in your bag as you seek to create the body you want. See what your local gym has on offer!